Director Krish who grabbed a special status and name through his movies ‘Gamyam’,‘Kanche’ and ‘Krishnam Vande Jagadgurum’ has now developed his ability to draw scripts on innovative thoughts with commercial elements which will be surely liked by Telugu audience and producers. Director Krissh who is well known in industry has even also developed the art of controlling budget as seen in the case of ‘Kanche’ which was made on second World War backdrop. All these became a reason and criteria which made Krissh to win a chance of directing Balakrishna’s 100th film. As known,Balayya, who has a bad habit of granting call sheets to near and dear ones primarily gave a chance to Sai Korrapati and 14 Reels have jointly to produce his film as they made for LEGEND. They even sketched the plan to produce NBK’s 100th flick in Balayya’s lucky fame Boyapati Sreenu direction. But, due to some issues and problems at the end of last minute Krissh unexpectedly entered into the frame and ran away with bumper offer steering on Satavahana script. Although, Sai and 14 Reels tried their best to produce this project with help of Balayya, Krissh made a condition that he was ready to direct Balayya only under some specifically applied conditions. The major and only one he asked Legend was that he wanted his best buddy Rajeev Reddy to be given production duties in order to step forward to direct NBK’s 100th film. Balayya keenly observed the track record and bonding between Krissh, Rajeev Reddy watching their earlier films.Now, Balayya had no option and reason to ask Krishh sit calm or to quit the name of Rajeev Reddy but instead silently nodded his head to words of Krishh says industry. This made the star producers of 14 Reels andVaarahi to quit from project of producing Balayya 100th film says sources. 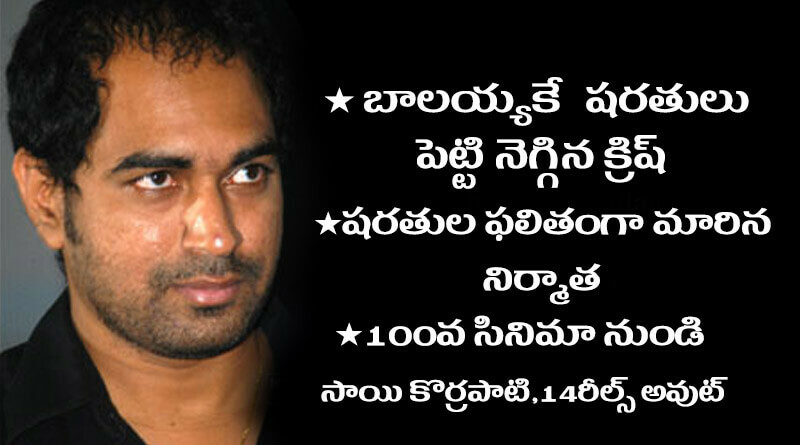 Anyhow Krishh made Sai Korrapati and 14 Reels to quit from Balayya.